I received products for review from Colgate. The opinions within this post are of my own and I was not influenced in any way. Please do your own research before purchasing products or using services. Your opinions and results may differ. It's only a few days in to the New Year, and most of us have made resolutions. Taking care of your teeth, if you don't already, should be one of them. Add Colgate Optic White Express White Toothpaste to your beauty essentials for a fast and easy way to brighten your smile, giving you whiter teeth in just three days. Just throw the convenient travel-size tube in your bag when packing for your travels and you’ll be ready to show off your #BrilliantSmile in all those photos and selfies! I'm not vain but teeth and eyes are the first thing I tend to notice about a person. I love the beauty of white teeth and a nice smile. I also know the confidence that comes about from a pretty smile. 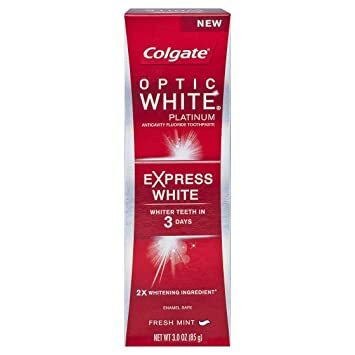 With a fresh mint taste, Colgate Optic White Express White Toothpaste deeply whitens below surface stains, for teeth that are brighter in a matter of days. There's also the added benefit that this toothpaste protects enamel and contains anti-cavity fluoride protection. My teeth aren't so white that I'd be cast for a commercial but I have noticed that they are whiter than when I first started using the toothpaste. I'd say the toothpaste is worth buying if you want to see some improvement on the whiteness of your teeth without paying a large price for a professional whitening system. I can't wait to try this nice toothpaste. It sounds like it is very great.